Alastair Seeley leads Jack Kennedy on his last appearance in the Mondello Masters Series in 2009. Alastair Seeley will make a one-off return to the Masters Superbike Championship this weekend at Bishopscourt for the first time in eight years. The Carrick man will ride the ex-Ryan Rainey IFS Yamaha R1 on Sunday, when the Norman Brown Trophy race takes centre stage at the penultimate round of the short circuit series. 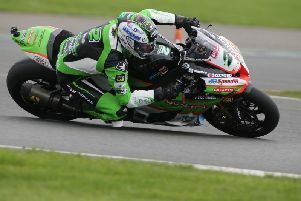 Seeley has been competing on the Spirit Moto2 machine this season in the Dickies British Supersport Championship but misses this weekend’s round at Cadwell Park. Since the 37-year-old’s last appearance at Mondello Park in 2009, the Masters has changed from a winner-takes-all Grand Final – held three times per season – into a seven-event championship, which this season consists of 20 races on three different circuits. Seeley, who dominated the Mondello Masters when it was first introduced as a series of one-off races, will be aiming to add to the IFS Racing team’s previous wins at Bishopscourt, with Rainey and Robert English both earning victories in 2015 and 2016 at the Co Down circuit. The fastest Superbike and Supersport riders will line up in the blue riband Norman Brown Trophy race to bid for the silverware and a share of the £1,150 prize fund, which is separate to the Masters races. Richie Ryan leads the Masters Championship and is the clear favourite to be crowed champion this year on his Mobil-backed Yamaha R1 after opening up a lead of 73 points over Charles Stuart (Yamaha R1), who won both races last time out at Mondello Park. Mark O’Byrne is third on the Ray Quinn Solicitors BMW but is coming under increasing pressure from Ahoghill’s Luke Johnston – the reigning Masters Supersport champion – who has been making strong progress in his debut season on the Unlimited Industries BMW. A number of riders are expected to return to the series on Sunday at Bishopscourt, including Randalstown’s Gerard Kinghan on his Kawasaki. Peter Moloney and Brian McCormack could also feature after being involved in huge accidents in the July round. Meath’s Cody Nally returned to form at the last Mondello Park event and also enters the podium equation. In the Supersport class, Jason Lynn remains in front in the title race on the Walter Bell Suzuki ahead of KP Racing’s Ross Patterson. Between them, they have won ten of the 14 races this season and the championship pacesetters will be aiming to continue in the same vein this weekend. However, they face stiff opposition from Korie McGreevy, who has made occasional appearances in the Masters Series this year, securing two victories. Also certain to feature at the front is Supersport Cup leader Eunan McGlinchey from Aghadowey, who continues to impress on his stock Suzuki. Kia McGreevy is another highly promising young contender, who became the first Cup rider to win a Supersport race outright in the previous meeting at Mondello in soaking wet conditions at Mondello. Mark Conlin is also entered as he makes his return to the Masters for the first time in three years. A packed programme on Sunday features two races each for the Pre Injection, Supertwins, Production Twins and Lightweight Supersport classes. Racing is scheduled to get underway at approximately 12noon on Sunday following practice.